p.s. Has anyone gotten their SDtMH yet? I want to know if the bonus features made it onto the disc! I hope this list of extras for DMC's So Dear To My Heart is not a complete one. If so, there's a major ommission when compared to the South American Region 4 DVD of this movie. 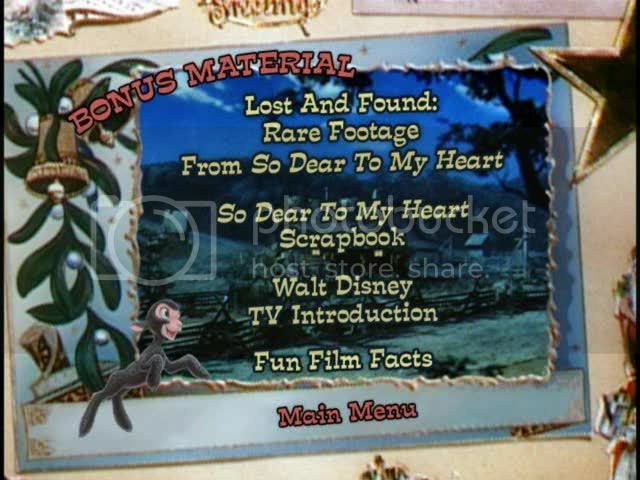 The Region 4 disc does not have the two animated shorts listed above, but does include a section called "Lost and Found" which shows about 25 minutes of unused footage with commentary by Scott McQueen, Senior Manager of Disney Film Restoration and film historian Les Perkins. There's some fascinating footage in there along with great insights on the making of the film. I hope it's included in DMC's DVD release. If not, you should all know that the South American DVD is fully compatible with Region 1 DVD players in the USA and can be found at Amazon.com under the title "Meu Querido Carneirinho". Only the cover and disc artwork are in Portuguese, but when you play the disc, the first thing that you'll see is a selection of languages. Just choose "English" and from there you'll be able to enjoy the movie and wonderful special features exactly as if it was a US release. Last edited by RowMan on Tue Jul 15, 2008 8:49 pm, edited 1 time in total. I hope this list of extras for DMC's So Dear To My Heart is not a complete one. If so, there's a major ommission when compared to the Brazillian Region 4 DVD of this movie. Last edited by jrboy on Tue Jul 15, 2008 7:34 pm, edited 1 time in total. Wow. Looks to me like the South American DVD's the better deal then. I wonder why they decided to add two unrelated animated shorts in place of a half an hour of rare unused footage from the actual film. Just guessing here, but Disney frequently seems to default towards programming for the 5 year old, not the collector. Not a big surprise that they'd dump anything an avid adult fan might be interested in and replace it with more cartoons. Can you do screencaps for us? I already ordered the one from the club so I am stuck with that one lol. I also ordered the other ones, so stuck with them as well lol. Check Out My Disney Music Videos now in HQ! Sounds about right for Disney. Seems they would rather take the time, effort, and money to remake the disc into an inferior one as opposed to making slight changes in the menu structure to a superior disc they already have. I hope I'm wrong, but what other explanation could there be? Especially ones we already own, sometimes several times over. I ordered SDTMH as I'd been waiting on a DVD version for a while now. Is Moon Pilot or The Monkey's Uncle worth getting and does anyone know what the extras are on these? Moon Pilot and The Monkey's Uncle are worth getting only by virtue of the fact that they are not available on DVD anywhere else. No extras seem to be listed for either one, though. I just received my copy of So Dear to My Heart yesterday and watched it last night. I don't have any screencaps to post, but I must say the digital transfer looks quite clean. Only the animated sections look a bit fuzzy. I had heard so much about this film, but had never viewed it prior to purchasing it as a DMC exclusive. It truly is a beautiful, sentimental, and inspired film. They don't make family entertainment like this anymore. Yes. I remember this movie being shown on The Disney Channel years ago, when I was a kid (when DC was a premium channel), but I never watched it... I was old enough to be busy with part-time work at the time. But, I checked out the VHS title from a movie rental store about 3-4 years ago, and have loved it ever since -- it is likely my #1 favorite Disney film of all. I purchased a clean VHS product from eBay a year or two ago. Now, I'm eagerly awaiting my DVD -- I joined DMC especially because of this exclusive release. Do the menu screens look different or the same as the screencaps I posted for the South American DVD? RowMan, thank you SOOO MUCH! I cannot wait to get my hands on my copies now! I can add more once I get my copies. The South American screen caps look identical to this release, except for the different entries for the bonus features. Looks like the same transfer, at least based on those few caps. Walt Disney’s <b><i>So Dear To My Heart</i></b> is a lovely, nostalgic film that is very dear to my own heart. It is set during the turn-of-the-century, a favorite time period of Walt’s. Though the town in this film is a little more backwoods and rural than the small town atmosphere that was his blueprint for Main Street USA at Disneyland and many of his films including <i>Pollyanna, Summer Magic,</i> and <i>Lady and the Tramp.</i> The story is about young Jeremiah (played by Bobby Driscoll), who lives with his sometimes cranky, but always forgiving grandmother, played by the wonderful Beulah Bondi. Jeremiah has a special scrapbook in which he pastes colorful pictures he clips from magazines. In his vivid imagination the pictures come to life and give way to clever animated sequences. The segues to and from animation are really quite ingenious. A little black lamb, rejected by its mother becomes Jeremiah’s pet to raise and he dreams of taking it to the county fair and winning the blue ribbon. The lamb grows up and becomes quite a pest destroying nearly everything it its path. Uncle Hiram, the town handyman (Burl Ives) is an ally to the boy and helps to repair the damage and soften up granny into letting them all go to the fair. 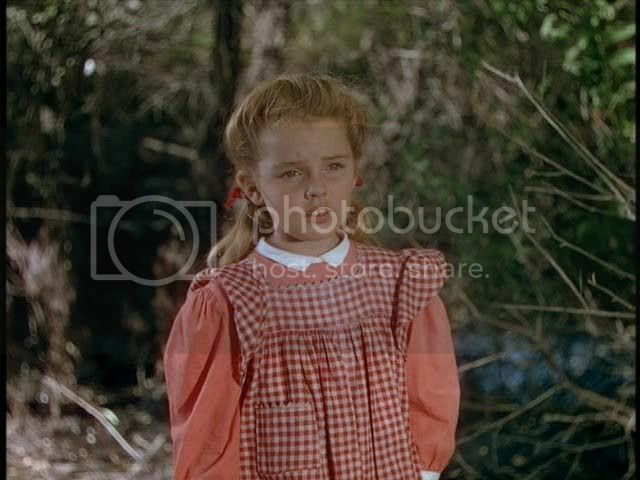 Tildy (Luana Patten) is a friend to Jeremiah and even helps him search for bee trees so he can sell the honey to the town grocer to earn the money to go to the fair. It is never said what became of Jeremiah’s parents, and for that matter if and how Tildy is related to him, she might even be Uncle Hiram’s daughter. The acting is first rate all around and it’s clear that a lot of care was taken to give this picture the perfect period feel. The film also has a strong sense of religious values making it a good candidate for family viewing, but at the same time refrains from getting preachy. Based on my experiences with other Disney Movie Club exclusives, I was afraid this might be another retread of an old transfer. But rest assured it’s not. It’s been remastered and looks wonderful. I assume this remastering effort is from some years back when it was prematurely announced that <i>So Dear To My Heart</i> was coming to DVD, then the region 1 release was mysteriously aborted. It is probably the same transfer that is currently available in Brazil and Europe. Colors are bright, the image is sharp and black levels are accurate, though there are a few blemishes here and there but nothing terribly obtrusive. The audio was another surprise. There is only one soundtrack, and it has been remixed in two-channel dolby surround. Voices are clear and kept in the center while music and effects are spread around. Some boosting of the bass has given the music a little more pizzazz and overall it’s a very enjoyable listening experience. It would have been nice if they had included the original mono sound as an option. When you insert the disc and press play you get an ad for Disney movies, then a 1970s opening to the Wonderful World of Disney, then the main menu comes up. As far as extras go, there’s a Scrapbook containing still pictures of the designs from the film, the original Black & White opening to its 1954 telecast on “Disneyland” hosted by Walt, and two cartoon shorts - <i>Out of Scale,</i> and <i>Brave Engineer.</i> The rare extra footage included on the Brazilian disc is not included here, presumably due to space as this is only a single sided, single layer disc. I can’t tell you how pleased I am that this wonderful Disney Classic has finally come to DVD, even though currently it’s only available to Club members. Perhaps sales will be good enough to get Disney to consider rolling it out to everyone and maybe even a special edition? It certainly is deserving of it. Then perhaps they will reconsider the fate of <i>Song of the South,</i> ya think? 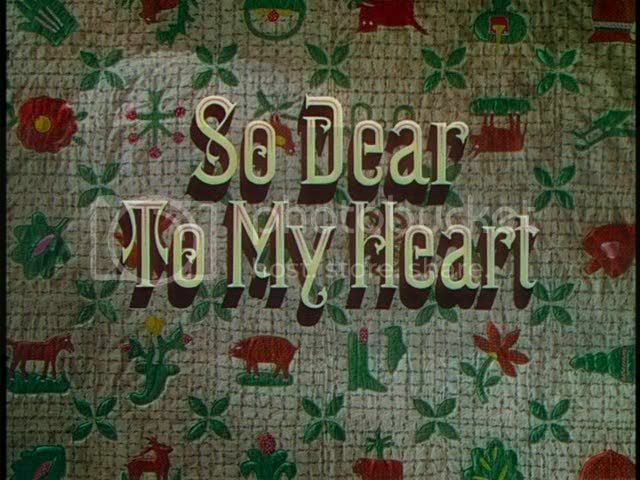 I received my DMC introductory shipment in the mail, and am VERY grateful to have an American DVD release of "So Dear to My Heart!" I do hope that sales will be strong, such that Disney would distribute it to the general public, and include the extra footage that has been left out of this DMC exclusive edition. As it is, the facts, conceptual art, and promotional stills were informative, so I'm glad to get these as bonus materials. I will tell you, I'm very puzzled by the cover and back art treatment. As you can see from Poppins#1's cover display, Disney has placed Luana Patton's character at the center of the collage, relegating Bobby Driscoll to the side in the distance. On the back cover, Luana is holding Danny the Lamb, and Bobby and the lamb are looking at her. Someone unfamiliar with the movie will look at the product and suppose the story is about a young girl and her lamb! The product design team has to be familiar with the story, because the back cover movie description frames the situation of a boy and his lamb. Also, the cover designs would give the mistaken impression that the children interacted with the cartoon characters, which they didn't. WOW, this was an amazing movie! I loved this movie SOOO much! I am so glad I bought it! It had a lot of family and most important Christian values to the story. This movie was such a blessing. I had tears in my eyes at the end of it lol. I wasn't crying like I did with other movies but this movie will really movie you. I am so glad I have this movie now. I will be watching it again soon. Also, this was Walt Disney's first full length live action movie. They added in the animation later after the movie was complete cause everyone thought all Disney movies should have animation in it. Also was there a soundtrack to the film? I know some songs where released to CD but not all correct? Also, this was Walt Disney's first full length live action movie. Nope- The Reluctant Dragon, Victory Through Air Power, and Song of the South came out before So Dear to My Heart. Right but they all had animation in it. So Dear To My Heart was shot without any animation in mind and they added it later cause Walt thought Disney movies should have animation. I forgot where i read it lol but I will try and find it.